The Wallbarz gymnastics set Woodsy are sturdy wall bars of the new generation. The wall bars Woods are made of wood and makes a lot of fun to play for hours for children from the age of three thanks to the valuable additional equipment. The gymnastics set Wallbarz Woodsy includes wall bars and a rope ladder each with eight rungs made of birch, adjustable gymnastics rings, and 26 mm thick climbing rope. 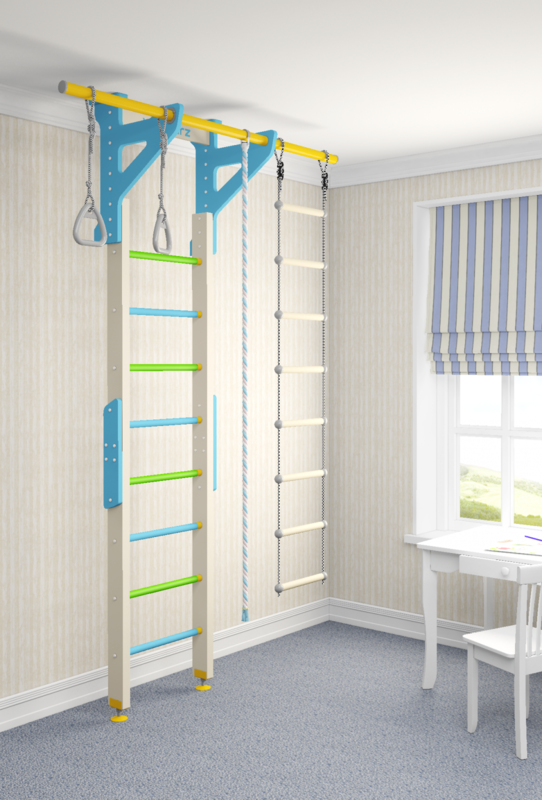 The versatile gymnastics set Wallbarz Woodsy suports the development of your children. The little ones can either climb safely on the wall bars or on the rope ladder. Climbing trains the body control and skills. While climbing, the motor skills are extended and a high playing value is achieved. A training on the gymnastics rings helps your children to develop the whole body power and coordination. The gymnastics set offers to types of mounting; without drilling fixing tightly between the ceiling and the floor or mounting on the wall. Solid lekeapperat som er lett å montere. stabiles, farbenfrohes Turnset. Meine Tochter (4 Jahre) ist von dem Ding total begeistert. Wallbarz puzzle mat In stock!